My discord id is Behr#5305. 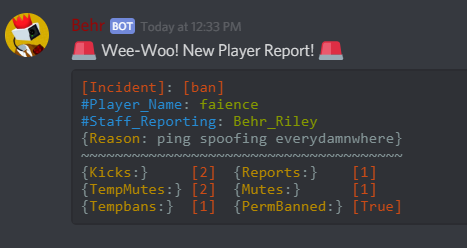 Feel free to @Ping me in the Denizen Script & Citizens Discord. I'm available to work on scripts for your server! I can work with English or Spanish if needed, Just note that the Denizen Discord is an English discord, so try your best to work with English if you can. * Helping you create, set up and configuration your Discord Bot & Discord Scripts in your channel & server. I've been scripting since sometime last year, however Denizen scripting is about all I do as my hobby currently, and has been for the past months. My experience wouldn't be rated more than a 6 or 7 on a 1-10 scale (11 being Mcmonkey), I'm familiar with most non-depenizen events and commands with Denizen and can confirm or deny capability of completing a script before proceeding. I charge $10 one-time for simple scripts, $20 one-time for intermediate scripts, and $20 per hour for more advanced scripts. Negotiations should be made in #Hiring only. Time counts will be rounded up to the next hour (so 30 minutes counts as one hour for payment, not half an hour). PayPal only please, I don't want to create anything else. All proceeds go towards helping me fund my double-patreon subscription and as donations to @Anthony5966 if the script includes the Message Constructor Library(Hover/Clickable-Command Chat). I'll offer free, lifetime bug fixes, debugging and updates for any scripts after our work is done! I charge my standard rate for adding new features though. Additionally, I will explain to you any sections of my scripts, and how they work directly as well if requested.